Heil® QuietComfort® DXT+ Two-Stage Air Conditioners featuring the Observer™ communicating system are designed to take your home to a new level of comfort and efficiency. Teamed with our Observer communicating wall control and a Heil communicating fan coil or gas furnace, the QuietComfort DXT+ functions as part of a complete communicating home comfort system. Various components of the system “talk” to each other electronically, fine-tuning comfort levels while maximizing energy savings. The QuietComfort DXT+ is built with premium components for quiet performance, including a two-stage scroll compressor with deluxe sound blanket. A variable-speed fan motor operates primarily on quieter, lower speeds (HCA9 models only). Operating sound is further minimized by advanced aerodynamic fan and air discharge systems. This model typically runs at the lower stage, switching to higher operating levels as necessary to provide steady cooling when outdoor temperatures rise. 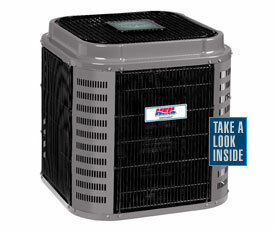 Custom-matched with a Heil variable-speed communicating fan coil or gas furnace, this two-stage operation delivers whisper-quiet operating sound levels and superior humidity control season after season. 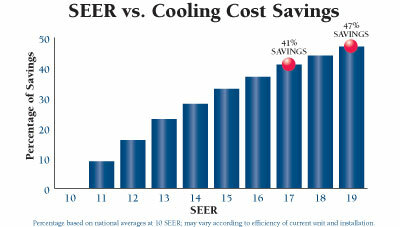 Energy-saving high-efficiency of up to 19 SEER could save up to 47% when compared to an older 10 SEER unit. 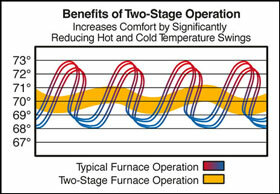 Two-stage operation reduces temperature and humidity swings in the home by heating and cooling evenly. QuietComfort DXT+ Two-Stage Air Conditioners featuring the Observer communicating system function as part of a complete communicating home comfort system that includes the Observer communicating wall control (with full-color touchscreen technology), compatible indoor coil, and system accessories to create maximum efficiency and ideal comfort.